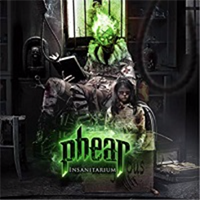 Power Metal breathes fire once again as PHEAR have recently re-released their stunning debut from 2015, the heavyweight “Insanitarium” has gone, quite rightly, international. With the use of some sonic-guitar cranking the glory days of Metal are revisited over an eighty-eight minute, thirteen-track glorious assault of your senses. Mixing the best components of the NWOBHM era, blending them and sculpting around their sound, making this offering by the Canadian-quintet a must in the air-guitar collection. It is very good, with surprises throughout, the assaulting journey kicks with a slice of terrifying noise before “Regan’s Dream” launches proper. The muscle of thrash-metal flexing effortlessly is always welcome and PHEAR have really been pumping the iron. Leading nicely into the second track “Don’t Scream” which continues along the same bombastic route, all in all a thundering and fine start to the album. The sublime single, “Fallen”, while not at the same level as the opener does retain enough of a spark to keep a listener hitched. On “Heaven”, the female guest-vocalist Basia Lyjak gives that extra dimension, a slower more reflective track, showing how the band is not all guts and noise. “Delusions” with the noise of rain, the crack of thunder, piano and strings brings the listener back full-on into the sound of PHEAR. Not as heavy as other areas but just as intense, eighties guitar riffs abound. This is a highlight track as the double vocal lines growling and clean tumble above a break-neck delivery. The surprises here come in the form of industrial experimentation, the wonderfully bleak “Motives Unknown” crossing the genres of metal while keeping instep with the rest of the album. In the two guitarists Tyson Emanuel and Graham Stirrett we find the nuts and bolts of PHEAR, the multilayered soundscape they create is the perfect vessel for the high-pitched screaming of Patrick Mulock. “In The Name Of…” is a hypnotic drum and bass showcase before the rest of the band join in, leaping forward with that intensity we fell in love with when we heard PANTERA for the first time. The song struts and staggers instead of simply going through bombastic motions. Here Mulock sounds more Ozzy Osbourne than anywhere on the album, keeping things moving forward into the guitar flair of “Sea Of Lies”. This exhibition of technique draws us in before the song properly reveals itself. PHEAR can construct very complicated songs while injecting a strong amount of passion into everything they do, their very power lies with this talent.